1 O God, by Thy name save me, And by Thy might right me. 3 For strangers are risen up against me, And violent men seek my soul: They set not God before them. Selah. 4 Behold, God is a helper for me: The Lord is He that sustains my soul. 5 He will requite evil to the liers in wait for me: In Thy troth destroy them. 6 Of [my own] free impulse will I sacrifice to Thee: I will thank Thy name, for it is good. 7 For from all distress it has delivered me; And my eye has seen [its desire] on my enemies. The tone and language of this psalm have nothing special. The situation of the psalmist is the familiar one of being encompassed by enemies. His mood is the familiar one of discouragement at the sight of surrounding perils, which passes through petition into confidence and triumph. There is nothing in the psalm inconsistent with the accuracy of the superscription, which ascribes it to David, when the men of Ziph would have betrayed him to Saul. Internal evidence does not suffice to fix its date, if the traditional one is discarded. But there seems no necessity for regarding the singer as the personified nation, though there is less objection to that theory in this instance than in some psalms with a more marked individuality and more fervent expression of personal emotion, to which it is proposed to apply it. The structure is simple, like the thought and expression. The psalm falls into two parts, divided by Selah,--of which the former is prayer, spreading before God the suppliant's straits; and the latter is confident assurance, blended with petition and vows of thanksgiving. The order in which the psalmist's thoughts run in the first part (vv. 1-3) is noteworthy. He begins with appeal to God, and summons before his vision the characteristics in the Divine nature on which he builds his hope. Then he pleads for the acceptance of his prayer, and only when thus heartened does he recount his perils. That is a deeper faith which begins with what God is, and thence proceeds to look calmly at foes, than that which is driven to God in the second place, as a consequence of an alarmed gaze on dangers. In the latter case fear strikes out a spark of faith in the darkness; in the former, faith controls fear. The name of God is His manifested nature or character, the sum of all of Him which has been made known by His word or work. In that rich manifoldness of living powers and splendours this man finds reserves of force, which will avail to save him from any peril. That name is much more than a collection of syllables. The expression is beginning to assume the meaning which it has in post-Biblical Hebrew, where it is used as a reverential euphemism for the ineffable Jehovah. Especially to God's power does the singer look with hopeful petitions, as in ver. 1 b. But the whole name is the agent of his salvation. Nothing less than the whole fulness of the manifested God is enough for the necessities of one poor man; and that prayer is not too bold, nor that estimate of need presumptuous, which asks for nothing less. Since it is God's "might" which is appealed to, to judge the psalmist's cause, the judgment contemplated is clearly not the Divine estimate of the moral desert of his doings, or retribution to him for these, but the vindication of his threatened innocence and deliverance of him from enemies. The reason for the prayer is likewise alleged as a plea with God to hear. The psalmist prays because he is ringed about by foes. God will hear because He is so surrounded. It is blessed to know that the same circumstances in our lot which drive us to God incline God to us. "Strangers," in ver. 3, would most naturally mean foreigners, but not necessarily so. The meaning would naturally pass into that of enemies--men who, even though of the psalmist's own blood, behave to him in a hostile manner. The word, then, does not negative the tradition in the superscription; though the men of Ziph belonged to the tribe of Judah, they might still be called "strangers." The verse recurs in Psalm lxxxvi. 14, with a variation of reading--namely, "proud" instead of "strangers." The same variation is found here in some MSS. and in the Targum. But probably it has crept in here in order to bring our psalm into correspondence with the other, and it is better to retain the existing reading, which is that of the LXX. and other ancient authorities. The psalmist has no doubt that to hunt after his life is a sign of godlessness. The proof that violent men have not "set God before them" is the fact that they "seek his soul." That is a remarkable assumption, resting upon a very sure confidence that he is in such relation to God that enmity to him is sin. The theory of a national reference would make such identification of the singer's cause with God's most intelligible. But the theory that he is an individual, holding a definite relation to the Divine purposes and being for some end a Divine instrument, would make it quite as much so. And if David, who knew that he was destined to be king, was the singer, his confidence would be natural. The history represents that his Divine appointment was sufficiently known to make hostility to him a manifest indication of rebellion against God. 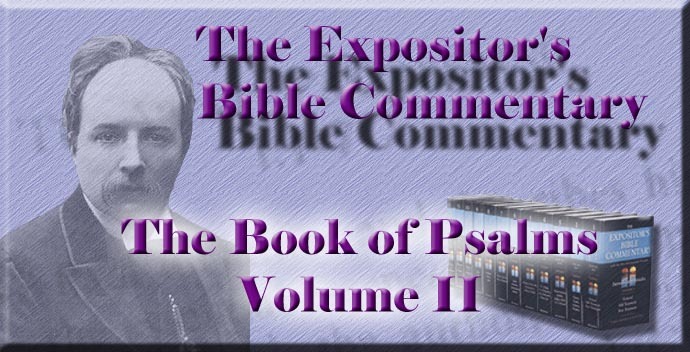 The unhesitating fusion of his own cause with God's could scarcely have been ventured by a psalmist, however vigorous his faith, if all that he had to go on and desired to express was a devout soul's confidence that God would protect him. That may be perfectly and yet it may not follow that opposition to a man is godlessness. We cannot regard ourselves as standing in such a relation; but we may be sure that the name, with all its glories, is mighty to save us too. Prayer is, as so often in the Psalter, followed by immediately deepened assurance of victory. The suppliant rises from his knees, and points the enemies round him to his one Helper. In ver. 4 b a literal rendering would mislead. "The Lord is among the upholders of my soul" seems to bring God down to a level on which others stand. The psalmist does not mean this, but that God gathers up in Himself, and that supremely, the qualities belonging to the conception of an upholder. It is, in form, an inclusion of God in a certain class. It is, in meaning, the assertion that He is the only true representative of the class. Commentators quote Jephthah's plaintive words to his daughter as another instance of the idiom: "Alas, my daughter, . . . thou art one of them that trouble me"--i.e., my greatest troubler. That one thought, vivified into new power by the act of prayer, is the psalmist's all-sufficient buckler, which he plants between himself and his enemies, bidding them "behold." Strong in the confidence that has sprung in his heart anew, he can look forward in the certainty that his adversaries (lit. those who lie in wait for me) will find their evil recoiling on themselves. The reading of the Hebrew text is, Evil shall return to; that of the Hebrew margin, adopted by the A.V. and R.V., is, He shall requite evil to. The meanings are substantially the same, only that the one makes the automatic action of retribution more prominent, while the other emphasises God's justice in inflicting it. The latter reading gives increased force to the swift transition to prayer in ver. 5 b. That petition is, like others in similar psalms, proper to the spiritual level of the Old Testament, and not to that of the New; and it is far more reverent, as well as accurate, to recognise fully the distinction than to try to slur it over. At the same time, it is not to be forgotten that the same lofty consciousness of the identity of his cause with God's, which we have already had to notice, operating here in these wishes for the enemies' destruction, gives another aspect to them than that of mere outbursts of private vengeance. That higher aspect is made prominent by the addition "in Thy troth." God's faithfulness to His purposes and promises was concerned in the destruction, because these were pledged to the psalmist's protection. His well-being was so intertwined with God's promises that the Divine faithfulness demanded the sweeping away of his foes. That is evidently not the language which fits our lips. It implies a special relation to God's plans, and it modifies the character of this apparently vindictive prayer. The closing verses of this simple, little psalm touch very familiar notes. The faith which has prayed has grown so sure of answer that it already begins to think of the thank-offerings. This is not like the superstitious vow, "I will give so-and-so if Jupiter"--or the Virgin--"will hear me." This praying man knows that he is heard, and is not so much vowing as joyfully anticipating his glad sacrifice. The same incipient personification of the name as in ver. 1 is very prominent in the closing strains. Thank-offerings--not merely statutory and obligatory, but brought by free, uncommanded impulse--are to be offered to "Thy name," because that name is good. Ver. 7 probably should be taken as going even further in the same direction of personification, for "Thy name" is probably to be taken as the subject of "hath delivered." The tenses of the verbs in ver. 7 are perfects. They contemplate the deliverance as already accomplished. Faith sees the future as present. This psalmist, surrounded by strangers seeking his life, can quietly stretch out a hand of faith, and bring near to himself the to-morrow when he will look back on scattered enemies and present, glad sacrifices! That power of drawing a brighter future into a dark present belongs not to those who build anticipations on wishes, but to those who found their forecasts on God's known purpose and character. The name is a firm foundation for hope. There is no other. The closing words express confidence in the enemies' defeat and destruction, with a tinge of feeling that is not permissible to Christians. But the supplement, "my desire," is perhaps rather too strongly expressive of wish for their ruin. Possibly there needs no supplement at all, and the expression simply paints the calm security of the man protected by God, who can "look upon" impotent hostility without the tremor of an eyelid, because he knows who is his Helper.